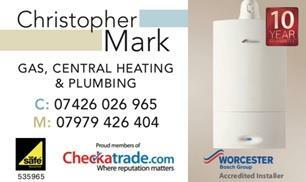 Christopher Mark Gas, Central Heating and Plumbing - Central Heating Engineer based in Birmingham, West Midlands. We are a local, dedicated central heating business with over 45 years experience. Our team are friendly and professional. We are Worcester Bosch accredited installers, and can offer up to a 10 year manufacturers guarantee on all new Worcester Bosch boilers. We rely on repeat business, therefore our work is carried out to the highest standard, alongside maintaining good customer relationships. We look foward to your call.